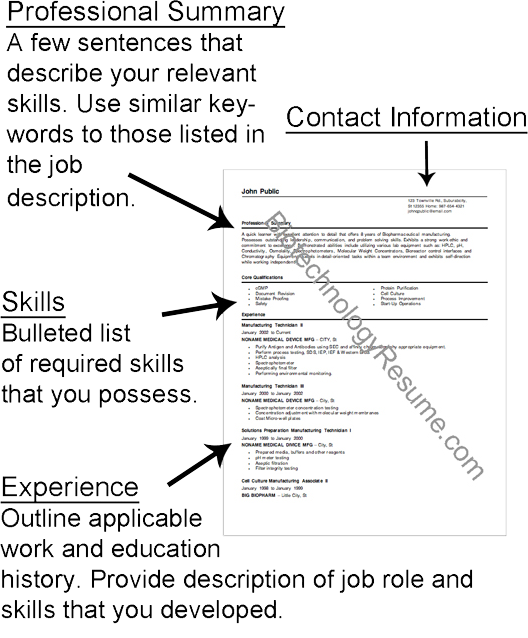 Here is an example of a simple resume format that quickly communicates relevant experience to a hiring manager. Include your contact information at the top of each page. Your email address should be professional and all communication with the hiring manager or the company’s Human Resource department should be sent from that email address. If your education is more related to the position you are applying for then list it before your previous work experience. If your work experience demonstrates that you are equipped to do the job then place that before your education. The idea is to have the most relevant information towards the top of your resume. Hiring managers and Human Resources receive a lot of resumes and by putting relevant information first makes their job easier. Your resume should not be longer than 2 pages. Once your resume is complete you need to decide if you are going to include a cover letter. If you have a a lot of experience or an advanced degree you may prefer to partner with a biotech resume service that can utilize your extensive history to your advantage.